We've all been guilty of this at one point. We see a negative news story published about a pit bull, or an attack that was supposedly done by a pit bull, and we click on the article. We read the article, looking for pictures of the actual dog involved in the attack, or legitimate scientific research quoted. Instead we find a stock photo of a snarling dog, and the report cites DBO (dogsbitedotorg). We're mad, and we want people to know we're mad, so we leave a comment. This will show them, we think. I have to stand up for this misunderstood breed. I have to show people how sweet they are. If I post enough comments, people's minds will change. Now, I know this is going to be a little hard to hear, but you need to stop clicking on these articles. You are hurting the very cause you're trying to help each and every time you click and comment. You are feeding the anti-pit bull machine. Please allow me to pull back the curtain, and show you the seedy underbelly of these articles. For a long time, I thought the same way that you do. I would write out long, well thought-out comments with legit science to back them up. I couldn't understand why pit bulls continued to be a target for the media. This cycle of picking one particular breed of dog to disparage, and attempt to exterminate has been been happening for decades. Those of us that are old enough remember the vilification of the Doberman, the German Shepherd, and the Rottweiler. All of those trends lasted for about ten years each. Why has the trend lasted for over a decade with pit bulls? We have more science proving these arcane theories about pit bulls to be patently false than all of those other breeds combined. Yet, it persists. My understanding changed when I started learning internet marketing. There are certain facets to internet marketing that most people know very little about. However, these facets are, in my opinion, why the media continues to publish negative stories about pit bulls more than they do any other breed of dog. Back in the 70s, 80s, and 90s the internet either didn't exist, or was in its infancy. The same rules didn't apply to Dobermans, German Shepherds, and Rottweilers. News operated in an old school fashion. Papers or television, those were your choices. There was no comment section. There was no clicking a "like" button. You read it in the paper, or you saw it on television, and perhaps talked about it the next day at work or school. News is big business now. News companies are giant corporations that operate in print and online, and giant corporations need money to operate. They get the money they need from advertisers; and they get advertisers to spend massive amounts of money by proving how many people visit their site during a specific period of time (be it daily, weekly, or monthly). They prove this to their advertisers by using two key piece of information: click rate, and comments. It's not just big business that follows these two very important pieces of data. Small businesses, Nonprofits, Facebook fan pages, etc. all have this information at their finger tips. Here's a screen shot from Bikers Against BSL's post about my last article published here at the Huffington Post. As you can see, this particular post reached 2,514 people. 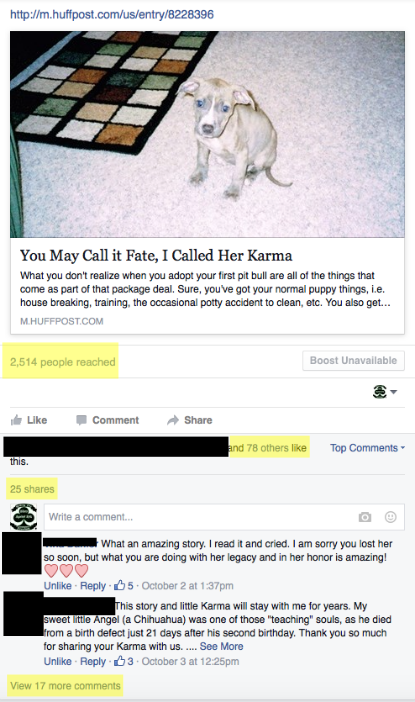 It has 81 (3 names blacked out for privacy) "likes," 25 shares, and has 19 total comments. These stats let me know what to post more of, because it's popular; and what to post less of, because it doesn't get a big draw. I know what you're thinking. Ok, Chris, I get all of that, but what does this click rate and comments have to do with me feeding the anti-pit bull machine? Glad you asked. Every single time you click on an article, or Facebook post, it's logged, and counted. Every single time you "like" an article via Facebook, it's counted. Every comment, or reply you make on an article or Facebook post gets counted. The higher those numbers get, the more money a news corporation can charge for ad space. There's an old news adage that says, "If it bleeds, it leads." 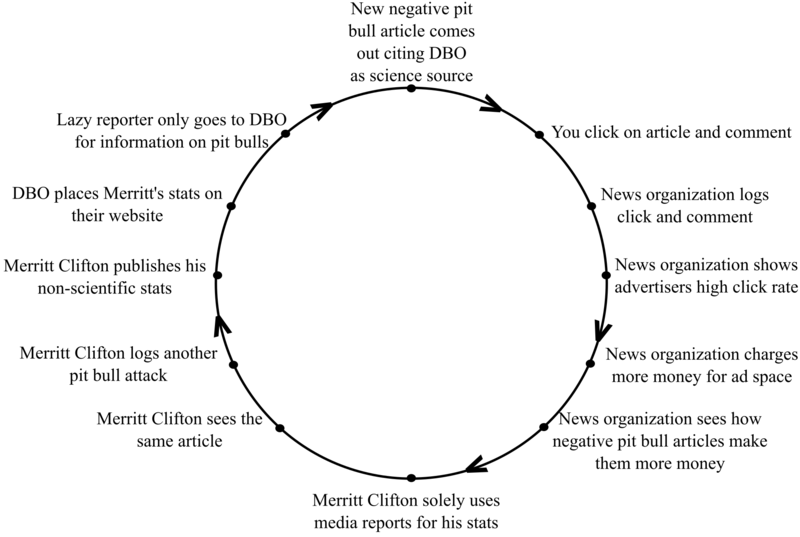 The same principle applies to negative pit bull articles. 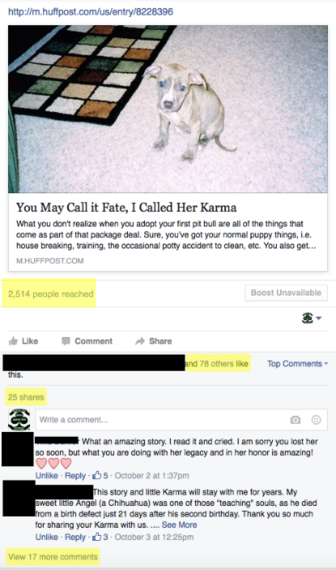 Have you ever stopped to look at the amount of comments on any negative pit bull article? I'm not talking about reading those comments, but just looking at how many there are. Typically, it's hundreds, if not thousands. This all contributes to the vicious cycle that people with good intentions perpetuate. I've made a diagram to help explain this further. We start out on the very top. A new article comes out that talks negatively about pit bulls, or is about a pit bull attack. The article is riddled with factual inaccuracies, and cites DBO (dogsbitedotorg) as their scientific proof of the plague of pit bulls. This article shows up on news sites, Facebook, Twitter, etc. Next in line is you becoming aware of this article, and clicking on it. You've heard how terrible this article is, and you must go and defend pit bulls. Your heart is in the right place. You want to help be a voice for the voiceless. You leave a comment telling people how great pit bulls are, and how you disagree with the article. You now go about your normal business; but there's a whole bunch of stuff you aren't aware of that's happening behind the scenes after you click and comment. That news corporation then compiles all this data of clicks and comments, and adds it to their site's overall data. Then the news corporation shows their advertisers how high their click rate, and comment rate is on the whole site. The advertisers are impressed. They agree to spend more money on ads on this news corporation's site because so many people are visiting/clicking on stories, and leaving comments. The news corporation sees which stories get the biggest response, and low and behold, negative stories about pit bulls get a ton of traffic. They'll want to do more of these stories. We're not done, though. There's a second half to this vicious cycle. Enter Merritt Clifton. An amateur statistician that readily admits he pulls all of his data about dog bites, and breeds from media reports. Merritt scours the internet looking for news articles about dog bites, and dog bite related fatalities. He happens to come along that same article you did. He sees that reporter called the dog a pit bull. He logs the date, location and breed without any further investigation. Later on, Merritt publishes his non-scientifically gathered data in a report. 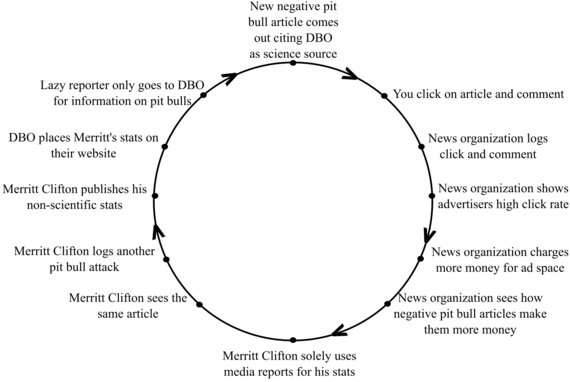 DBO then publishes Merritt's non-scientific report, and purports it as proof of the plague of pit bulls. In the last, and most tragic, step of this cycle, a different lazy reporter does a quick search about pit bull bites for a new story they're writing, and comes across DBO. The reporter grabs these non-peer reviewed stats and includes them in the new article. Now we're right back where we started, and the cycle begins again. This is why pit bulls are vilified in the media. Money. That's it. Stories about pit bulls attacking make news corporations money. They make money because people click on the articles, and comment. The news corporations don't care if they're helping contribute to misinformation. They want numbers/money; and as long as people continue to click and comment on these stories, they will continue to be published. The cycle will never end. These dogs are not bad dogs. They're not vicious. They don't attack without warning. They're sweet and loving dogs. They're best friends. They're goofy. They're family. I completely understand why you want to defend them in the comments section, but you need to stop. Your clicks count, and they matter. Use those clicks for good, not feeding the anti-pit bull machine. Conversely, we have a place like the Huffington Post that has chosen to do the exact opposite. They are flooding their pages with positive stories about pit bulls, and pit bull advocates. Click on these types of stories. Share them. Leave comments on them. Show the Huffington Post that we want more positive stories. If we ignore the negative, fear mongering stories, and focus on the positive stories, the tide will change. If you feed something, it grows, and it will continue to grow. If you don't feed it, it withers and dies. Keep in mind that you're trying to help save an entire breed from genocide. Don't feed the anti-pit bull machine. Don't click on those articles. Don't comment. Remember that no one has ever changed anyone's mind in the comment section of an article.